Once you’ve developed your membership site, it’s time to advertise it. If you don’t advertise, you’re going to have a hard time getting members because they won’t just happen upon your site. The good news is that there are plenty of ways to do this – many for free, and some for fairly cheap. Let’s take a look at the advertising methods that are free to implement. These include using a signature file, biographies, contributions to article directories, and ezine promotions. All of these are easy to do. A signature file is typically a short statement that is attached to the end of emails and in forum posts. A signature file gives information about your website(s) including links, so that interested people can visit your site and learn more about gaining membership. John. A Doe, ABC Marketing Enterprises, domainname.com, other contact information. Interested in XYZ123? Take a look at the new XYZ123 site! Something similar to a signature file is a bio box that’s attached to the end of an article. Your bio box provides a bit of information about you, your expertise, and links to your website(s). These can be instrumental in bringing traffic your way. Making contributions to article directories is an excellent way to get people to notice you and incite interest in your membership site. When you contribute well-written articles that offer value to your readers, they’ll learn to look to you as a respected expert. This gives you a name in the business and puts some power behind the links in the biography that you include with your articles. Your reputation as an expert is going to encourage people to check out your membership site. 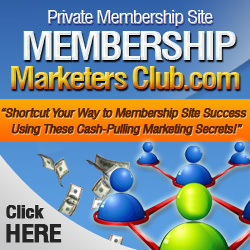 Another great way to advertise your membership site is through ezine promotions. You can either start your own ezine or online newsletter, or you can become a contributor to another marketer’s ezine. Either way, this gives you a perfect opportunity to remind readers that you have a membership site that they would like to explore. Part of free advertising is offering an incentive for trying your membership site to everyone who makes his or her way to you. This could be a free sample, discounts, coupons or a sale price. Don’t forget this step, because it’s going to be instrumental in creating interest. One way to advertise your site that does cost money, but that can be well worth your investment is PPC (pay-per-click) advertising. PPC gives you a perfect way to place enticing advertisements in places where your target audience will be looking for information. You can set your own advertising budget with PPC, and you have complete control. While it’s important to learn to use PPC correctly, once you do that, it can be a great tool for bringing more traffic to your membership site. Your membership site won’t advertise itself. You have to get out there and put some effort into this step. Fortunately, for your investment of time, energy and a possibly a bit of money, you’ll find that your traffic is increased as is your membership enrollment!